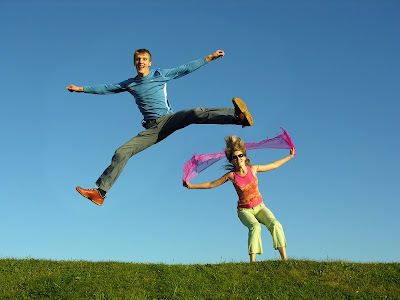 The Wedding University: Jump for Joy! I found this picture online and thought it was the perfect picture to show how excited TWU students will be after they finish a fun and inspiring day with us and realize that they will get to take home a faaaabulous gift bag full of goodies! What kind of goodies? Well, let's just say that some of the very top professionals are offering discounts for their services, ONLY for this event. It's unheard of, but that's right.....so here's another incentive to join us on February 8, 2009! Okay, one more 'secret'. Students will also get to take home a copy of the NEWEST issue of the Here Comes the Guide book (yes, the ultra thick one), and several other popular wedding magazines! I can't help myself....there's more! TWU students can get special room rates if they'd like to stay overnight at the Four Seasons that weekend, AND the hotel's restaurant Quattro is offering a 15% discount for those that would like to stay for dinner. Just let us know when you return your registration form and we can make those arrangements for you!